On the 23rd of February, 29 of our Surrey athletes alongside coaches Sam Tuck and Iona Riley, travelled up north to Newcastle to compete at BUCS Head which was held on the weekend of the 24th of February. 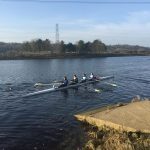 Upon arrival on Friday afternoon, the squad ventured to the Tyne Amateur Rowing Club to deload the trailer, rig all the boats and prepare for the upcoming competition. Hence, the crews went out for a paddle on the Tyne to get accustomed to the course and the changing wind conditions. For some of our development crews it was their first time to row on a river other than the Molesey stretch. The Beginnner Men’s 8 boat. The beginner women’s four at BUCS Head. The beginner men’s 8 was stroked by Wei Shen Chin, followed by Lukas Schroth, Shabaz Kamran, Roberto de Isidro, Christopher Homes, Wilson Sandengu, Abdel Abdalla and Zak Evans. They were coxed by Anika Piezka. Their race went very well, going on a strong and consistent pace despite changing wind conditions on the course. On the final 600m stretch, they overtook the University of York which motivated them to push even harder. They placed 5th out of the 25 crews entered and are pleased with the result, but feel that there is room for improvement. The women’s coxed four consisted of Maddy Brown, Lucy Thompson, Abbie Cook and Elisavet Palaiologou and was coxed by Fiona Norris. 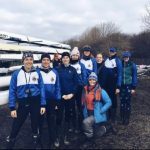 Despite having some difficulties with a rigger coming loose during the race they raced strongly, overtaking the University of Leeds within the first half of the race. They placed 10th out of 25 crews. In the afternoon, after a short break to get warm and eat, it was the beginner men’s four racing. 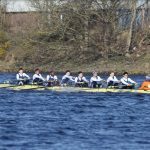 Coxed by Lizzie McCann, Lukas Schroth, Roberto de Isidro, Shabaz Kamran and Wei Shen Chin had only been out in the crew once before BUCS Head. Even though it being their second race on the day, they had a great race. This time they were better accustomed to the course and pushed on to finish 5th out of 23 crews. To conclude the day, the development squad were happy with their first races but they are definitely hungry for more and are already excited to race again. In the evening, the whole squad went out for a meal together. Furthermore, individual crew chats were held to motivate and summarise the day. Early on Sunday morning, the senior squad ventured back to the rowing club. 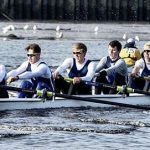 The intermediate men’s four consisting of HPASS athlete George Stewart, Mantas Volkauskas, Alex Law and Giovanni Morescalchi who were coxed by Lizzie MacCann, went out for a pre-paddle to prepare for their race. In the first division both the four and the intermediate women’s eight raced. First off were the women who were coxed by Naomi Coleman. 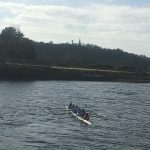 Jasmine Bone, Ellie Stevens, Anika Piezka, Megan Pearson, Charlotte Gill, Megan Moloney, Sophie Hossack and Fiona Norris had a strong paddle up the course in the cold conditions. Megan Moloney described it as: “Marshalling was tough, we sat around for a long time and it was very cold, nevertheless, we kept up the moral and all pushed hard down the course and moved the boat along very well.” With a strong race and a big push in the end, they placed 9th out of 44 crews. The men’s four took the confidence from their morning outing into the race. After marshalling, they had a strong race, pushing away from the crews following them up the course and catching up the crew in front. They placed 9th of 38 crews. In the afternoon division, the weather conditions changed and the water got rougher leading to delayed boating times and uncertainty of whether the races would take place. The intermediate men’s eight, coxed by Anika Piezka, were the first ones to boat and race. Due to the conditions, the course was shortened to about 3km. Giovanni Morescalchi, Ludovico Iannizzotto Venezze, Mantas Volkauskas, George Stewart, Ben Radcliffe-Brown, Roberto de Isidro and Lukas Schroth had not been out in this crew prior to the race. In addition, the eight was a beginner/ senior composite. 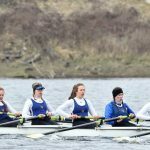 “We rowed well in both the novice eights and fours despite the tough conditions, and a chance to race in the intermediate eights gave me a better understanding of the standard we need to aim for in the novice eight. I’m pleased with the results knowing that this will only push us to strive for more.”, is how Lukas described his experiences of the weekend. They came 12th out of 46 crews. The intermediate men’s 8 at BUCS Head. Once they had put away their boat, the umpires decided that the rest of the races will go ahead on the shortened course. Megan Moloney put it this way: “Due to the very bad conditions and rapid loss of daylight hours whether the race was going to go ahead or not was touch and go.” Once it was time to boat for the intermediate women’s four and quad, the beginner men helped them onto the water to make everything go smoothly and quickly. The quad consisted of Jasmine Bone, Megan Moloney, Sophie Hossack and was steered by Naomi Coleman. 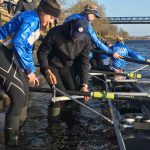 “The paddle up felt strong and we were super excited to start. At the start of the race we pushed off and settled on a strong rhythm v early on. We hit some huge waves but pushed on and made ground on the crew ahead. The cheers from the squad on the land really kept up our strength and we moved through Liverpool. The overall race was so exciting and it was great to see where we were in comparison to other universities. However, as a quad we would definitely have liked a higher position and are striving for medals in the near future.”, is how Megan described her race. They placed 7th out of 21 crews. 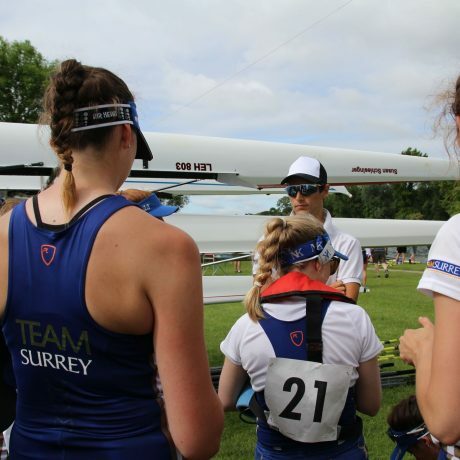 The intermediate women’s four consisted of Maddie Gardner, Megan Pearson, Charlotte Gill and Ellie Stevens and was coxed by Lizzie MacCann. They rowed up just after the quad and were very excited to race in the crew they had been in since the training camp in Seville. They raced strongly and maintained a high pace throughout the whole race. Finishing 8th out of 34 crews, they were pleased but are hungry for more. After the racing had finished, all the boats were derigged and the trailer loaded, the squad headed back down to Surrey. All over pleased with the results, we are now even more motivated to push for the medals. With the eights placing strongly in their respective categories, we are can’t wait to race at WeHORR and HORR in two weeks’ time.